Biden: "I'm the most qualified person in the country to be president"
Former Vice President Joe Biden said during a stop on his book tour Monday in Montana that his prior work on some of the country's most pressing issues leads him to believe he's "the most qualified person in the country to be president," CNN reports. "I am a gaffe machine, but my God what a wonderful thing compared to a guy who can't tell the truth ... No one should run for the job unless they believe that they would be qualified doing the job. I've been doing this my whole adult life, and the issues that are the most consequential relating to the plight of the middle class and our foreign policy are things that I have — even my critics would acknowledge, I may not be right but I know a great deal about it." The big picture: Biden said he will make a decision about 2020 with his family in the next two months. 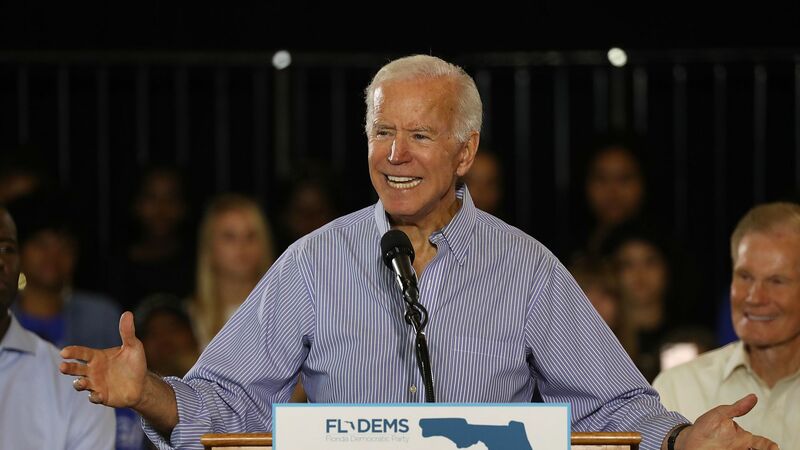 Axios' Jonathan Swan reported in October that Biden is the potential opponent Trump's staff worries about most, as they fear he'll steal Trump voters from the Midwest and cut into the president's dominance among white men and whites without college degrees.